If one day you scroll through your Instagram feed and end up coming across pictures of a gorgeous turquoise bay with thousands of limestone karsts jutting out of the water, I bet you’ll want to know where to find this paradise...well usually the hashtags give it away, but let me tell you. It’s Ha Long Bay. This bay is famous for being One of The New 7 Wonders of Nature, and you should pay it a visit to witness the miraculous beauty of nature. It is totally worth seeing! There are many activities to explore in Ha Long, however, island hopping is always the most exciting. Take a cruise, go kayaking, explore the national park and party until the early morning on the beach. 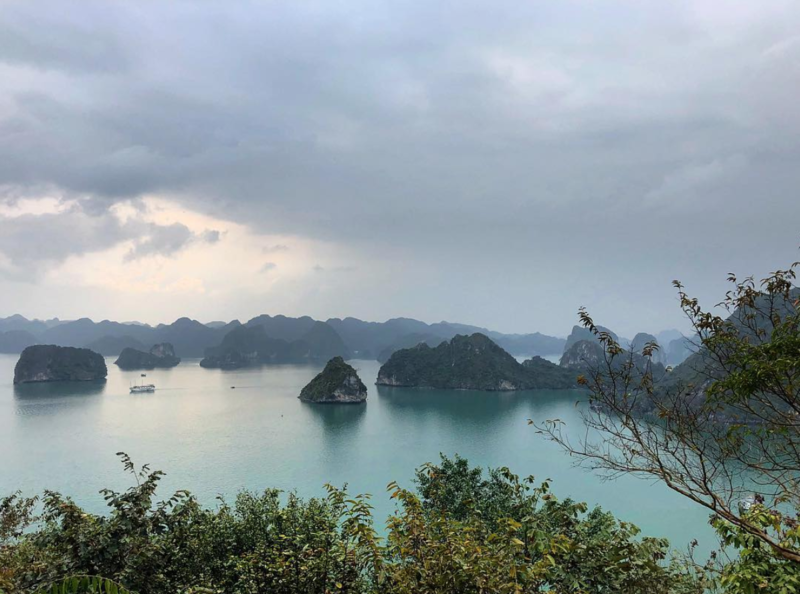 Most of the islands that belong to Ha Long Bay are protected and preserved by the government, so it is important to know which ones you can visit and how to explore the right way. In this article, I will provide you with all the information you need so you can sail away! Ha Long Bay is a spectacular work of mother nature located in Quang Ninh province. 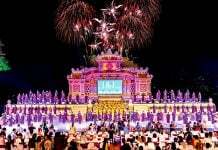 This 1,553 square kilometer area belongs to Ha Long city, Cam Pha city and a part of Van Don District of Quang Ninh province. The bay is home to thousands of limestone karsts and small islets, all in different shapes and sizes. 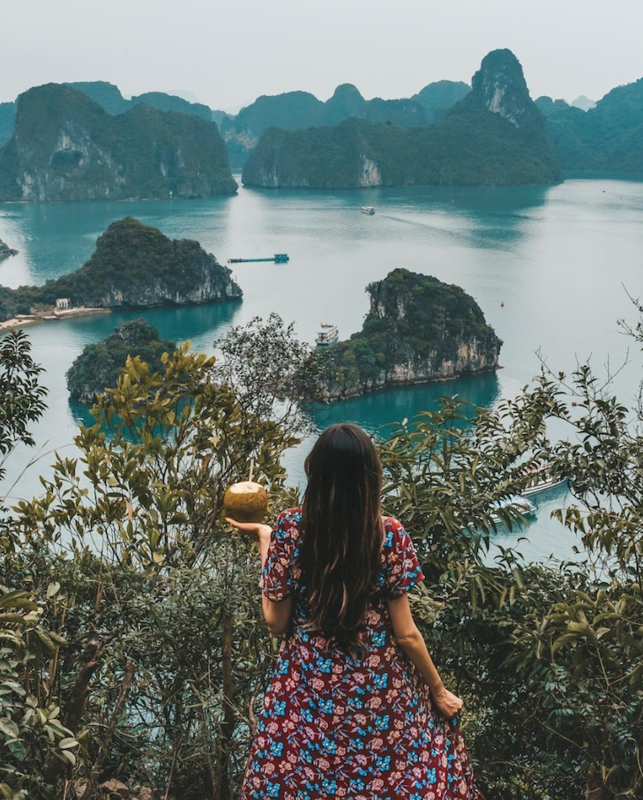 When is The Best Time to Travel to Ha Long Bay? 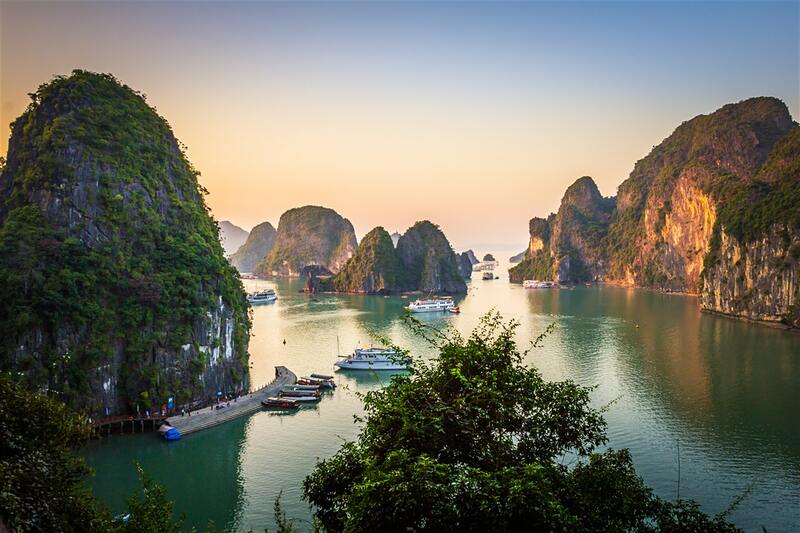 Due to the weather in Vietnam, ideally, you should visit Ha Long Bay in September, October, April, or May. This is the dry season. The weather might be a little bit hot, but it is not a big deal when you are about to jump into the blue ocean to swim anyway. 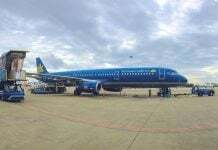 From November to March, it will be cold in the north of Vietnam. You can still visit Ha Long Bay during this time to escape the heat in the south. But don’t forget to bring a jacket with you. It’s likely that storms will occur frequently in the months of June and July. If you happen to be there during these months, the tour company might have to cancel your trip at the last minute for your safety. Last, August is the weather transition month. There might be heavy showers happening on some days of the month, halting your plans. Apart from that, it is still not a bad idea to travel to Ha Long then. 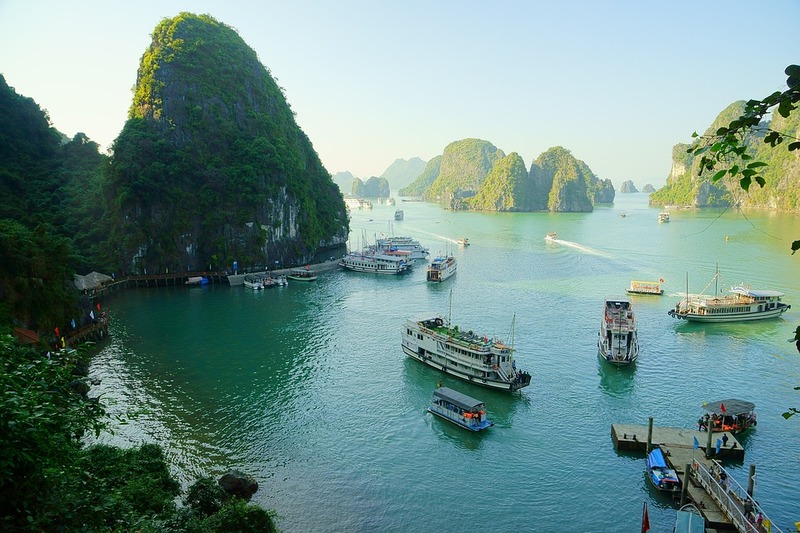 Now, let’s take a closer look at some famous islands and islets in Ha Long. At the heart of Ha Long Bay is Bo Hon Island. 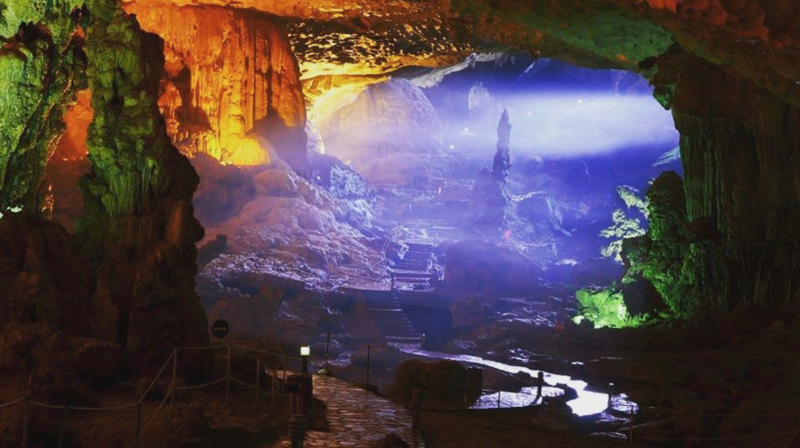 This is where you can find many famous caves, each of which has their own legendary stories for you to discover. Your boat will go past many beautiful green limestone karsts before reaching this island. The vertical cliffs of the surrounding landscape will surely astonish you. 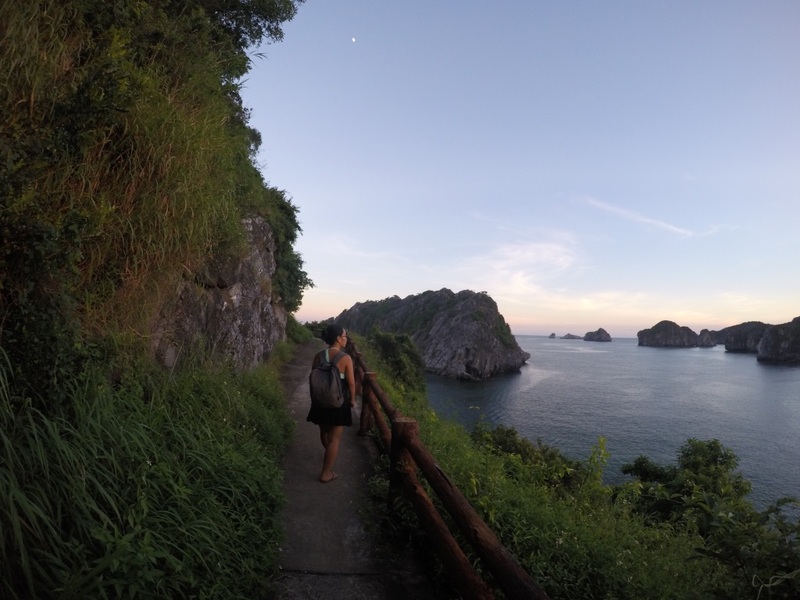 And most importantly, Bu Xam Islet located on the south side of Bo Hon is a wild place for those who are seeking an idyllic place to chill and listen to the choruses of songbirds and the chatter of monkeys. In 1962, Ho Chi Minh (Uncle Ho) and Gherman Titov, a Soviet Cosmonaut set foot on this island to have lunch during their Ha Long trip. Uncle Ho, then, named this island after Titov. Nowadays, this island is a popular stop for visitors on their Ha Long trip. From above, the beach of Titop Island looks like a romantic crescent, hugging a green karst mountain. There is nothing more wonderful than relaxing on the white sand and looking at the magnificent bay. Compared to the other islands, tourism is quite developed in Titop. Some services can be found here such as a bar, souvenir shop, swimsuits/lifevest renting service, along with parachute services. Before docking at the island, the boat/cruise will stop at a floating village for you to shop for some fresh shrimp, snails or fish to have a picnic beside the beach. Long story short, this island is always full of people. So it is not on the top list if you are searching for a solitary place. Just 700 kilometers away from Titop Island, Soi Sim Island is a great escape for those who don’t want to be surrounded by too many tourists. As tourism has yet to develop on this island, Soi Sim still retains all the pristine beauty that mother nature gifted it. Come to Soi Sim Island to have a lazy day, doing nothing but sunbathing on the sandy beach, falling asleep and dreaming of being lost on an island. Actually, it won’t be a dream! In addition, there is a trail that leads to the top of the mountain, where you can follow the stairs for a great view of the green limestone karsts and blue ocean. Maybe a monkey will join and start tugging at your hair or drinking from your water bottle. For a more authentic local experience, you should check out Ngoc Vung Island. Some romantic people said that Ngoc Vung is a princess sleeping in Ha Long Bay. Legend has that in the past, there were a lot of pearls under the sea. At night, it glowed and lit up the whole island. That’s why people here called it Ngoc Vung (shiny pearl). This area has not yet been touched by tourism so you can explore something natural and undisturbed. What makes this island special is that it even has a fresh-water lake, and the locals who live here can even grow a paddy field of rice! The big waves also bring big jellyfish to the seashore. People then will catch them to make tasty dishes, which you should try, for example, jellyfish salad. This island is also one of the few islands where you are allowed to spend the night. A trip to Ngoc Vung is going to be one of the most unforgettable memories you make. You can get the high-speed boat at two stations: Van Don – Ngoc Vung or Hon Gai – Ngoc Vung. 1. It’s a great way to see a part of Ha Long Bay without spending too much time offshore! I have a very bad seasickness (as you might have guessed)! When I took a day trip on a cruise with my family a few years ago, I couldn’t really enjoy anything because I was busy throwing up all the things in my stomach out and praying for the journey to end as soon as possible. Meanwhile, taking a ferry to Cat Ba only required 1 hour and 45 minutes traveling. Therefore, I could still enjoy the true beauty of Ha Long Bay without having any health problems. To go from and to Cat Ba via Tuan Chau port, the ferry cost 60,000 VND/pax/per way. The most popular way to get around Cat Ba town is taking a public electric vehicle, which costs around 10,000 VND per trip. 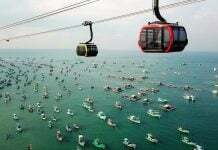 There are three drop-off destinations: Cat Co 1 Beach, Cat Co 3 Beach, and Cat Ba Market. Motorbike rental services are also available in most hostels and hotels. The price fluctuates between 200,000 – 300,000 VND/day, the price doesn’t include gasoline. Some places require a deposit or your passport. Don’t forget to ask for a confirmation paper to guarantee that you will get your money back. From fancy resorts to backpacker hostels, there are plenty of options that satisfy your budget. Take a look at our guide to Cat Ba for some accommodation suggestions. Once you travel to Cat Ba, don’t leave without trying the amazing seafood. Although there are a lot of restaurants on Nui Ngoc street, I still recommend going to the market and buying fresh seafood. It is a fun experience to choose the fish, shrimp or sea snails that are still alive, buy it with a reasonable price then bring it to a food cart located on the second floor of the market to have it prepared. Depending on the way you want to cook your food (boil/grill/fry or saute), the price will be around 20,000 – 50,000 VND/per kilogram. During my stay on Cat Ba, I usually eat at a local restaurant called “Yummy” at 277, Nui Ngoc, Cat Ba. The name says it all, they serve many YUMMY dishes from Asian cuisine to western options. They all come with a pocket-friendly price. I highly recommend it! 3. It has a lot of activities to do! It’s hard to get bored in Cat Ba! This is where you can go trekking in the national park in the morning, then jump into the jade blue ocean in the afternoon and watch the sunset later on. If you feel like socializing in the evening, just head to any pub and bar on the main street. 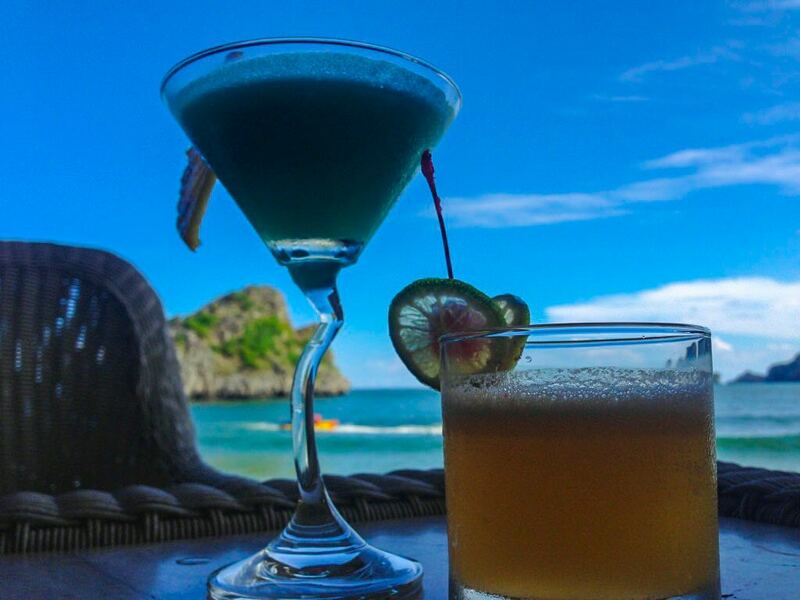 I love the cocktail and spaghetti at Cat Co 1 Resort beachfront bar. Drinking cocktail with such a view! C’est la vie! 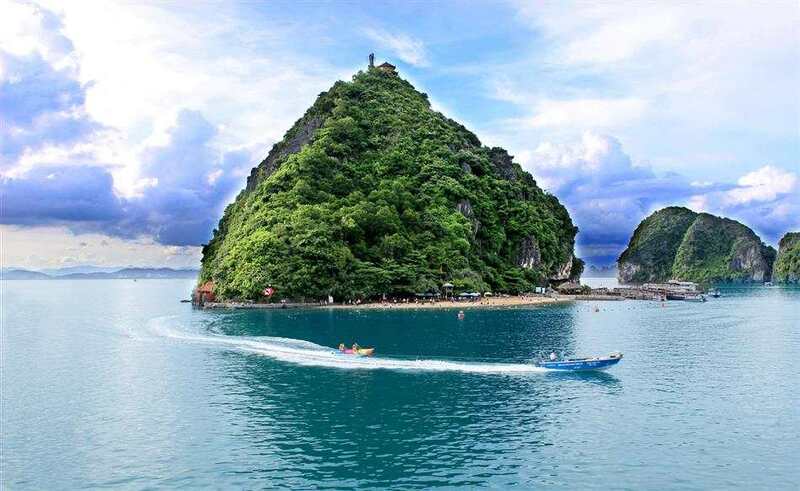 There is a tour option to the pristine Lan Ha Bay for the explorers to escape the mainland for a little while and do some activities, such as scuba diving, snorkeling, kayaking or simply enjoying the magnificent view of the bay. 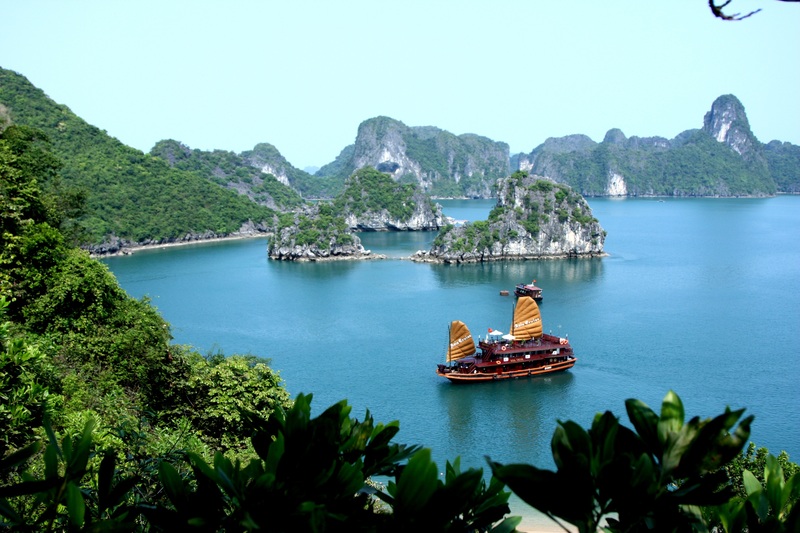 What is a Good Halong Bay Tour to Do?